PALM BEACH GARDENS, Fla. (AP) — Justin Thomas and the USGA are taking their Twitter beef over rules changes offline. USGA senior managing director of championships John Bodenhamer said Sunday that he hopes to meet with Thomas in the coming days to discuss some of his criticisms of the modernized Rules of Golf that took effect this year. The world's No. 3 player hasn't been shy about airing his displeasure about the changes both verbally and on social media, and the USGA's public-relations arm went back at him to suggest setting up a meeting. "Look, it's clear, I'm sure to everyone, that direct communication is the best way to go," Bodenhamer told Golf Channel. "That's where we're going to go with this. We're going to talk with Justin, and we're happy we'll have an opportunity to have a conversation in a few days, hopefully." The USGA said in a tweet that Thomas has canceled previous meetings. Thomas, speaking Sunday after his final-round 71 at the Honda Classic, said that is not correct. "It was a little shocking," Thomas said of the Twitter back-and-forth. "I've had communication with the USGA and I've talked with a couple people about how I feel. ... It's a little upsetting just because it was inaccurate. I haven't canceled anything, especially any meetings. But it is what it is and all I want is the best for the game of golf and the best for the sport." Thomas said there have been some attempts to set up calls, but his schedule over the last three weeks hasn't allowed one to happen. The Honda Classic provided a plethora of rules-related issues and reactions. 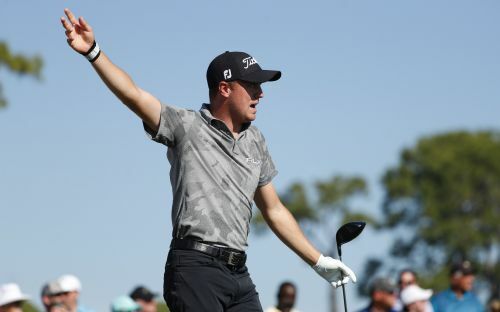 Thomas was upset that he wouldn't have been able to replace the 9-iron that he bent when his follow-through went into a tree in the opening round. It was a moot point anyway, since Thomas said he didn't have a spare 9-iron with him at PGA National that day. But it was the bigger issue that he was upset about, and he wasn't alone as the week went along. Alex Cejka was disqualified Thursday for using an oversized greens-reading book, which fell under the new changes. Rickie Fowler made a mockery of the new drop rule, one where players must release the ball from knee-level. Adam Schenk was told just before the start of his third round that he was being assessed a two-stroke penalty for his caddie being behind him as he prepared for a bunker shot in the second round. "The rules have changed and I'm not a big fan of them. I disagree with some of them ... but at the end of the day, it's the Rules of Golf and we've got to play by them," said Ryan Palmer, who was playing with Cejka on Thursday. "I've been reading Twitter and reading comments and I'm not liking what people are saying about us as a whole, as tour players when it comes to the Rules of Golf. "They're not great, that's for sure. Some of them are BS, that's for sure," Palmer added. Schenk's issue was the one that had Thomas venting on Twitter, and had the USGA taking notice. "I just think it needs to be changed," Thomas said. The Twitter back-and-forth had Thomas saying that he was speaking out with "hopes that the USGA starts communicating with the current players to better the game and the sport." That's when the USGA replied with a tweet that began, "Justin, we need to talk. You've cancelled every meeting we've planned with you, but we are reaching out again." Later, after Bodenhamer said Thomas reached out privately, the USGA posted, "We look forward to meeting with you and talking through these issues. It's clear we both want to do what's right by the game." Rules officials from tours around the world, led by the USGA and R&A, spent five years overhauling the rules to make them simpler and easier to understand for pros and recreational players alike. The change in the drop received plenty of attention. Players are also allowed to putt with the flagstick in, a change made largely to speed up recreational play, but some tour pros have started putting routinely with the pin in, saying it gives them an advantage. At least the schism between Thomas and the USGA didn't grow Sunday, after the 2018 Honda champion put his tee ball in the water on the par-3 fifth. His drop was proper, from knee-height. "We're all looking to better the sport and better the game," Thomas said.